The Metroid franchise is an old one, dating back to the original game released in Japan in 1986 and in the United States in 1987, now more than twenty-two years old and still going as strong as ever. Every new entry to the series always scores very well, seeing average review scores of about 90% or better. The first Metroid Prime, the start of the Prime trilogy, remained the second-highest-scored game of all time from its November 2002 release until just this year when it was finally demoted by a few games, but it even still holds strong in the top ten highest-scored games of all time (still number five behind four other games, though GTAIV is actually listed twice on GameRanking's list). This is quite a legacy to follow, but Metroid Prime 3: Corruption does it marvelously. In fact, this is arguably the best game in the franchise to date, although you wouldn't quite tell it by looking at the review scores. Corruption finishes the Prime trilogy (kind of a sub-series within the overall Metroid series) with a game that builds on top of what the previous games have done and offers up a lengthy singleplayer experience good for easily twenty hours that's full of action, puzzles, and problem-solving from start to finish. Corruption does something that no previous Metroid game has done: span more than one world. 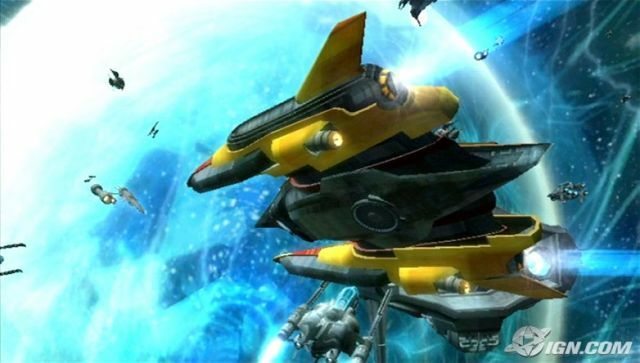 Sure, previous games have had some action take place on a satellite or space ship and then go to a world wherein most of the game takes place, but Corruption actually features several planets to explore, although none of them offer quite as much territory to explore as any single planet in the other games. Corruption also adds a new play mechanic whereby Samus' space ship goes beyond simply a save/heal location to being something she can summon at various points in her travels to do various tasks, and it can be upgraded during the player's progression through the game. Corruption also utilizes a lot of voice acting and cutscenes wherein Samus interacts with other humans and humanoids for the first time in the franchise, as previous adventures have been lonely solo ordeals. Surely the most noteworthy addition to Metroid Prime 3 is the full utilization of the Wii's motion controls. Other games have toyed with motion control, with varying degrees of success (or failure), but Corruption shows how to do it right, and to run with it. Though it can take some time to get used to, especially after years of doing the primitive dual-analog control schemes of previous first-person games, Corruption's controls are, without a doubt, the best first-person controls ever seen as of its release and even since. I went from Corruption to Halo 3 and reverting to dual-analog control was an obvious step backwards. It isn't just the aiming and looking around with the "Wiimote", but other functionality employed throughout the game. For example, there are things to interact with that require movements of the controller, like pumping motions to prime something before activation or turning a lever. Samus gains a grappling beam that she can use in a variety of ways, including stuff like stealing shields from enemy Space Pirates, and she can yank things by pulling the controller's "nunchuck". A major game mechanic from which the game gets its title is corruption. Specifically, Samus is contaminated by the Phazon that players have encountered in the previous two Prime titles. She acquires a Phazon Enhancement Device (PED suit) that enables her to harness the power of Phazon to enter a Hyper mode which bestows great power upon her but puts her at risk of being completely corrupted by the Phazon if she is not careful. 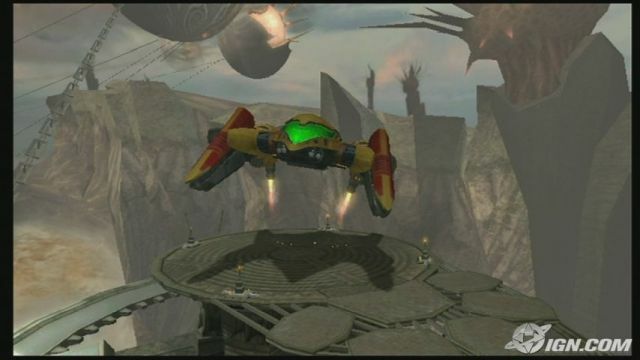 Players can jump in and out of Hyper mode at will, but must be careful not to allow themselves to be corrupted and must constantly fire their weapons to discharge the harmful Phazon to prevent Samus' demise. 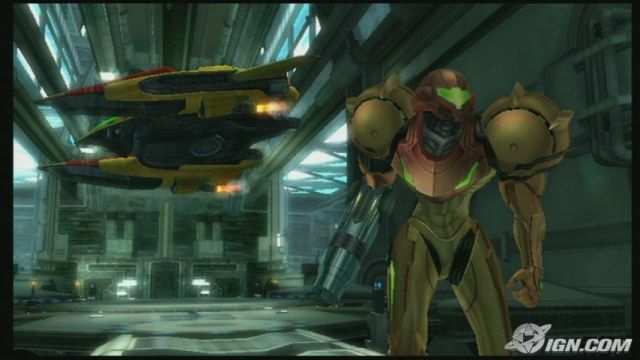 As the player advances through the game, if they are observant they may notice visible evidence of Samus' corruption by watching the changes to her face, seen reflected on the inside of her visor at times. Moving on the the more shallow, this game is pretty impressive to look at... for something running on the Wii hardware. Easily the best-looking game on the console, the game used brilliant art direction and some graphical magic to make the game look fantastic even on a console that isn't all that much more powerful than those of the previous hardware generation. The game's engine is rendering larger and more complex environments than those seen in the previous two Prime titles. The game employs bloom lighting to give a nifty glow effect to stuff like lava, explosions, and computer monitors. The game runs in Progressive scan (as opposed to Interlaced), can be displayed in 16:9 widescreen, and runs at a smooth 60 frames per second (FPS), while so many games on the more powerful Xbox 360 and PlayStation 3 systems often run as low as 30 FPS. Of course, the game is just as much a treat to the ears as it is for the eyes. The game's moody soundtrack is a perfect fit and also features some remixes of some songs from previous titles. A welcome addition comes in the form of voice acting, with Samus frequently encountering humans and other sentient beings (including an organic supercomputer) that speak to her, and fortunately Retro had the good taste not to give Samus a voice. I guess one final note I want to make is that the game features a big throwback to something fans should appreciate from the classic 2D Metroid games of yesteryear. The ultimate antagonist of the original Metroid game, and of the third game Super Metroid, was basically a giant brain in a huge glass containment mechanism by the name of Mother Brain. 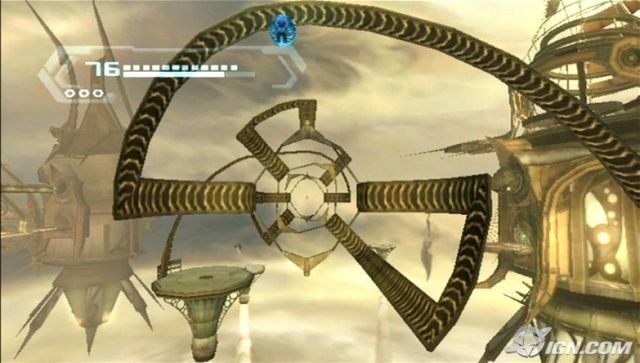 Metroid Prime 3: Corruption involves a couple organic supercomputers known as Aurora Units, and they're basically giant brains like Mother Brain. 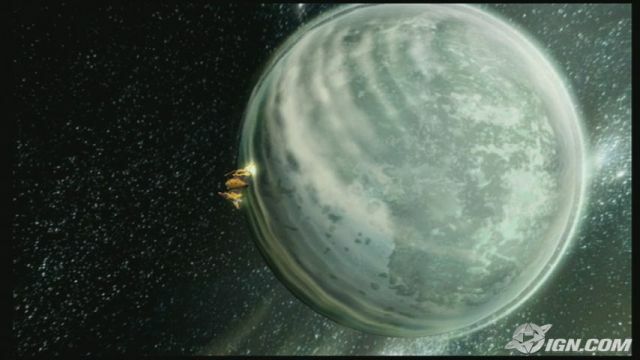 Prior to the game's release, a teaser video for the game spoke of these Aurora Units and shown a blueprint for the location of one of them, and it looked like the area where Mother Brain resided. Though none of the Aurora Units in Corruption are actually Mother Brain, the Aurora Units are an obvious throwback to her. It's just a Wii game, so it can't compete with the HD games of the 360 and PS3, but it looks fantastic for something running on Wii hardware. This was the best-looking game on the system upon its release, and still images do it an injustice. It's difficult to ask for more here. The music is the same greatness we've come to love from the series, the sound effects are great, and the game is now loaded with voice acting (something previously lacking in the series). 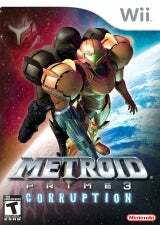 This is the best game in the Metroid Prime trilogy, and arguably in the entire franchise, and besides a lengthy game it also utilizes WiiConnect24 and offers lots of bonus features to unlock. Cinematics and voice acting bring the action to life. As always, this installment of the outstanding Metroid series brings more action and puzzle-solving, both in great measure and does a fantastic job of both. Perhaps most notably, this game shown how to do motion-control right and offered the best first-person controls in home console gaming without peer. This isn't even an option. If you enjoy "core" video games, you have no choice but to own this game. Completion of the game is good for at least twenty hours, and it's such a joy from start to finish. hey. sounds awsome man!! i like my multi player though. this game sound like it needs some death match or somthing. 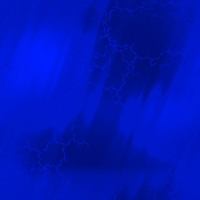 then that mite make it a perfect 10. i dont know if i could get use to them motion control though?? Online multiplayer is something Nintendo hasn't yet been very big into, but that's slowly changing. More and more of their games are starting to allow online multiplayer, including Mario Kart Wii and Super Smash Bros. Brawl. I'm not into multiplayer, but it wouldn't have hurt for the feature to have been there. Perhaps future Metroid titles will do this.